Prescription opioids are medicines used to relieve pain your health care provider may prescribe if you’ve been injured or had surgery or dental work. Prescription opioids include codeine, fentanyl, hydrocodone, morphine, oxycodone, and tramadol, among others. Prescription opioids are sometimes used to treat a cough or diarrhea. Are there risks associated with taking prescription opioids? Opioids have gotten a lot of attention in the United States because they are easy to get addicted to. Along with helping relieve pain, they also release chemicals in the brain that can make you feel calm and intensely happy (also called euphoria). Drug addiction is a brain condition that leads to using drugs, even if they’re harmful, because they affect self-control and your ability to stop using a drug. If you take prescription opioids during pregnancy, they can cause problems for your baby, such as premature birth and neonatal abstinence syndrome (also called NAS). NAS is when a baby is exposed to a drug in the womb before birth and goes through withdrawal from the drug after birth. Even if you use an opioid exactly like your health care provider tells you to, it still may cause NAS in your baby. What can you do if you take a prescription opioid while breastfeeding? Breastfeeding is beneficial for you and your baby. 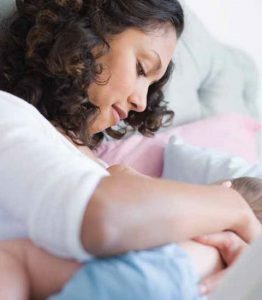 It helps you bond with your baby and your breast milk helps build your baby’s immunity to protect her from infections. If your baby has NAS, breastfeeding may help make her withdrawal less severe so she needs less medicine and can leave the hospital sooner. Make sure your provider who prescribes the opioid knows you’re breastfeeding. Take the medicine exactly as your provider tells you to. Talk to your provider about switching to a safer pain reliever if you take codeine, hydrocodone, meperidine, oxycodone, or tramadol. Pain relievers like ibuprofen (Advil®) or acetaminophen (Tylenol®) are safe to use when breastfeeding. Talk to your provider about ways to avoid addiction to opioids. If you have questions about exposures and medication use during pregnancy and while breastfeeding, call MotherToBaby toll-free at 866-626-6847 or send a text to 855-999-3525. You may also visit their website at mothertobaby.org. Can low dose aspirin reduce the risk of preeclampsia?